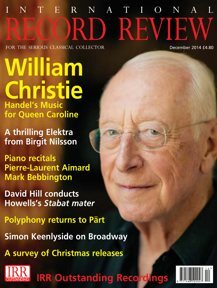 Almost certainly the hubbub will have disappeared by the time this review is published, but as I listen, think and write the musical and wider world is full of gossip printed and otherwise about the assertion by Darwin University academic Martin Jarvis that Bach's Cello Suites are in fact Mrs Bach's Cello Suites. That the copy in Anna Magdalena's hand ‑ our best source for these six iconic, mould‑breaking works ‑ is no copy at all but the working manuscript of the true composer. The basis of this theory put forward as indisputable fact by Jarvis has something to do with the weight and assumed speed of the hand. Like many such 'discoveries', the academic's blinkered desire for it to be true has outweighed the need for due diligence. copy, made by Johann Peter Kellner in 1726. Anna Magdalena's comes from between 1727 and 1731. Whoops. What we do have, though, is the music: music which challenges the cellist as no music had ever done before it; music which turns popular dance forms into high art; music which possesses aspiration and expressive depth; music, in other words, which does what we expect Bach ‑ Kapellmeister Bach, not Mrs Bach ‑ to do. These two accounts present diametrically opposing views of it and, like me, readers will probably gravitate towards one or the other but not both. 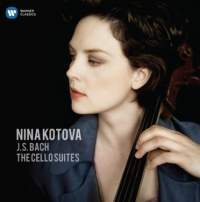 The Russian‑American cellist Nina Kotova has all the hallmarks of a superstar. Glamorous of looks, she has made a point of playing the celebrity game, appearing on television chat shows, featuring in Vogue and Elle and, dare one say, even featuring as cover artist for Classic fM magazine. She plays the most gorgeous cello, the 1679 du Pré Stradivarius. She is a confident and fluent virtuoso, but for me she just does not 'get' Bach at all. While it is true that one can show too much reverence for these works, or that one can over‑romanticize them, what one cannot do is to present them primarily as vehicles for virtuosity. Yet that is exactly what Kotova seems to do. There is a relentless hardness about her readings, the sound all high‑tension steel. Speeds often seem deceptively fast for much detail of articulation to survive intact ‑ indeed, occasionally one loses a sense of metre. No room is given to draw breath and consequently the music feels constrained, riddled with self‑conscious rather than natural-­sounding mannerisms. Kotova seems intent on imposing herself upon music which has no need of such an imposition. Half the secret of playing Bach lies in knowing just how far to stand back from oneself, as it were, and simply let the notes do the talking. Examples of moments that jar lurk at every corner: the elided echoing phrases in the Bourrée of the Fourth Suite, the relentless charge of its Gigue, or that of the Prelude of the Fifth Suite, the lack of space and soul afforded the Fifth's Allemande. It's less a matter of Baroque 'rules' not being applied ‑ I still enjoy the first recording I knew, that of Paul Tortelier, who as much as anyone else wore a subjective heart on his sleeve and whose interpretation showed little concern for historical exactitude ‑ but in the end one of a failure to understand the scale and the fundamental intimacy of these pieces. Nos. 1‑5 and a five‑string anonymous Bohemian instrument of around 1760 for Suite No. 6, both set up in the Baroque manner, with gut strings, and played with Baroque bows. The sound is of course lighter, more transparent, but also actually more flexible of colour. The lower tension of strings and bow see to that and also allow ‑ indeed necessitate ‑ minute attention to articulation and to detail. Above all de Hong, unlike Kotova, knows that this music needs to breathe naturally, to exist in its own space. Her tempos are invariably well chosen to maintain clarity of line, phrase and thought in both faster movements, such as the Gigue of the Third Suite, with its characterful drone effects, and in slower ones, like the ruminative Prelude of the Second Suite. 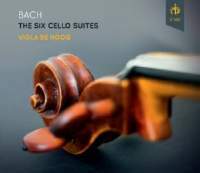 And whereas Kotova dispatches the works in numeric order, de Hoog is also more thoughtful about the order of the suites, the first disc containing the First, Fourth and Fifth Suites, the second the Third, Second and Sixth. As for the sound of each recording, Kotova is given the closely miked treatment which serves only to exacerbate the unfriendly metallic colours she draws from her instrument, the sound of hair scraping on steel very much in evidence. The ambience is perhaps by way of compensation warm and seems to provide supplementary resonance to that of the instrument itself. De Hoog, on the other hand, is presented much more naturally, at a slight but realistic distance , and a considerably lower decibel level, her acoustic theatre a friendly, well‑proportioned one.